During a routine ‘Boiler Washout’ examination of ex GWR small Prairie locomotive No. 5526 last week prior to it being sent away on hire to two railways this Summer, a visible crack was found on the boiler back head near a washout plug. The loco was then examined by the SDR Trust’s Workshop Manager using the Magnetic Particle Inspection process and again by our insurance company’s Boiler Inspector on Tuesday this week (13/3/12) to ascertain if the crack might be repaired by grinding out and welding, and then further subjected yesterday (Wednesday 14/3/12) to non-destructive testing using the Ultrasonic Testing (UT) process. As feared, the Ultrasonic test revealed some further cracking in addition to the visible one. None of the cracks can be repaired without the boiler being removed and, as a result, the loco has been withdrawn from service immediately after eight years of sterling service during which time the loco has steamed for many hundreds of days and also passed the one million mile mark from construction. Cracks can often occur in steam loco boilers but the news was unexpected. Sadly, the loco cannot, therefore, visit the Chinnor & Princes Risborough and Mid Norfolk Railways who had booked it as a hire engine from March to September and the loco will now have to wait its turn in the restoration queue at Buckfastleigh. With loco No. 3803 currently away on hire for the rest of the season at Shackerstone, this leaves the SDR with two operational locos in Nos. 3205 and 1369. The SDR Workshop staff will now be working hard to complete the contract repair of sister Prairie loco No. 5542 for the end of April and the SDR’s large Pannier No. 5786 as soon as possible thereafter, but SDR management is also looking into hiring an additional steam loco to provide cover for the peak timetable in July and August. 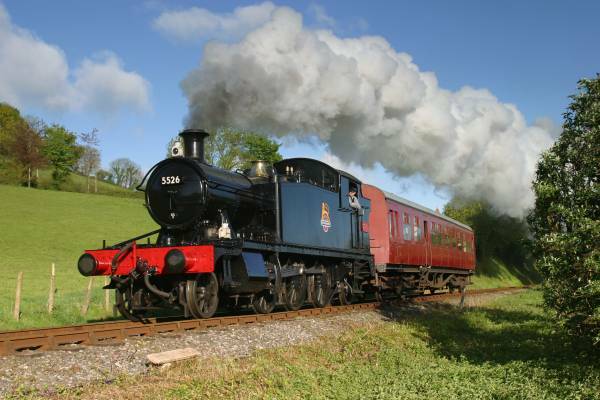 Two visiting BR Standard Class locos have been confirmed for Easter weekend in 4MT 2-6-4 Tank No. 80072 and 2MT 2-6-0 Tender No. 78019, and the Class 2 loco will also be staying on in Devon until at least June for various special events.